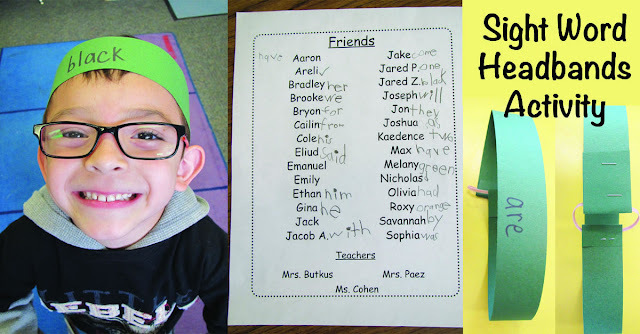 Here are FIVE great ideas to help you welcome the holiday season in your pre-K, Kindergarten, or first grade classroom, and a sleigh FULL of free downloads to go with them! There are downloadable instructions for Christmas Guided Drawing, a Christmas Tree matching sets activity to practice the numbers 0-30, a Sight Word Santa game, a Counting by Tens Christmas Tree Hat, and three different Christmas themed worksheets, including a graph, a counting worksheet for 10-30, and a Christmas tree color words worksheet. Boy, oh BOY! I hope you enjoy all of this, and have a wonderful holiday! 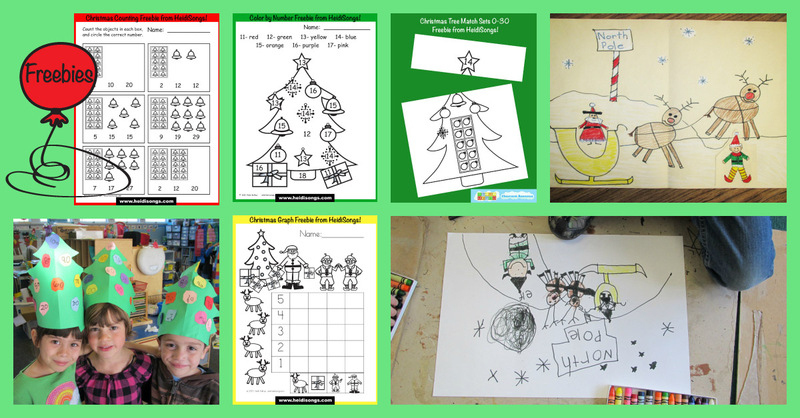 Back by popular demand, here are the instructions as a free download and some pictures for a Christmas themed guided drawing picture. Remember, the kids draw along with the teacher in a following directions and visual perception type of exercise that results in a fun drawing! My kids always wind up including these little drawings as illustrations for the sentences they are learning to write. 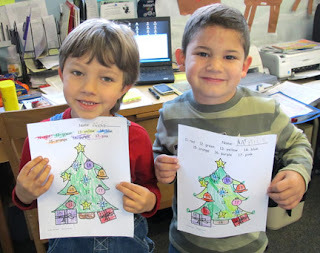 I also use these same drawings to illustrate my Christmas themed words on my word wall. Enjoy! 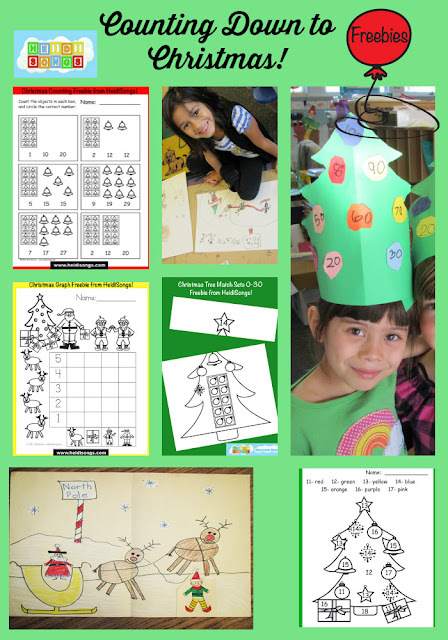 I decided that I wanted to make a holiday themed matching sets activity that went all the way from 0-30, so I came up with the idea of putting a number on the star at the top of the tree and putting that number of ornaments on the tree. You cut the top of the trees off, and the children have to count the ornaments and match up the correct tree to the correct star. I am including the file as a free download this week! 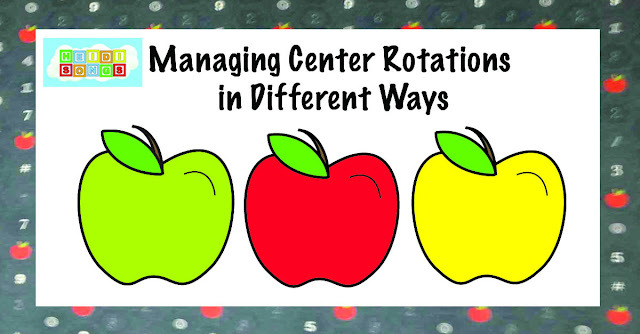 We have been working on this concept using manipulatives for quite a long time, especially using the egg cartons and holiday erasers, farm animals, or spiders, etc. However, it is still quite difficult for the children to count out that many objects correctly when they are merely pictures of the objects and not the real thing! Still, it was very good practice for them. It seems to work best to do it in small groups with an aide or another helper so that they can practice counting up the groups of tens in the ten frames, and then counting on from there. 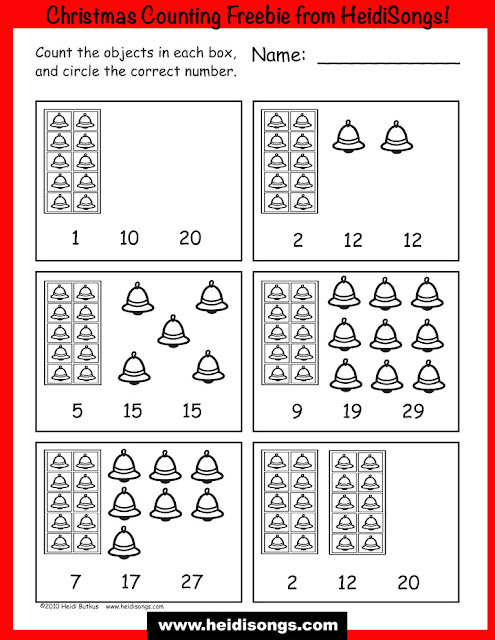 I recommend only keeping the cards for 21-30 totally separate and getting them out only when you are sure that your students have mastered 0-20. The cards are large, so if you are sure your students have already mastered matching sets from 0-10, just give your students 11-20 only and there will be more space to work in and less confusion! 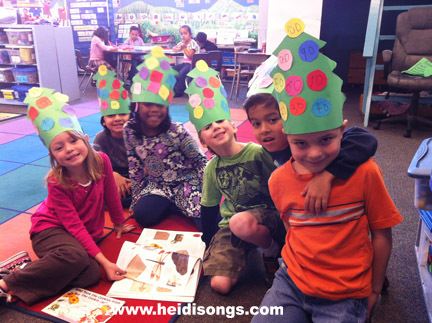 We have been working on our sight words, of course, and one thing the kids always love to do around Christmas time is to sing the "Here" song (which is sung to the tune of Jingle Bells) from Sing and Spell Vol. 1 and shake some jingle bells while they sing. I have six jingle bells to shake, so sic kids can shake them at a time, and we just take turns. 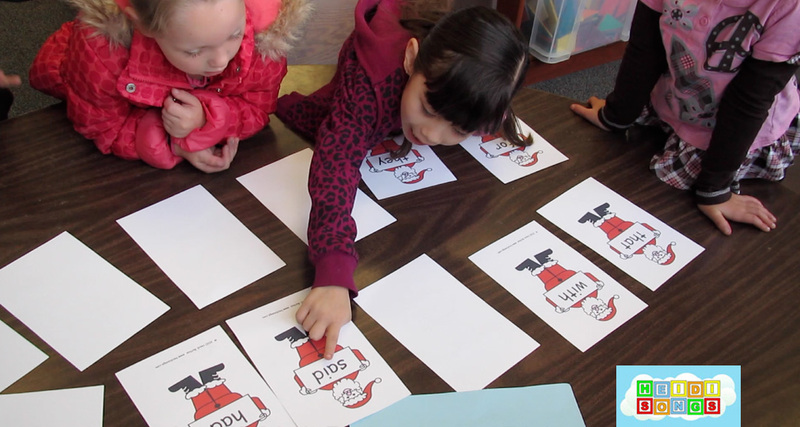 Another way to practice sight words is through this new game I made up called the Sight Word Santa Game. Remember that Turkey Tails game that I posted? Well this is just about the same thing, but with Santa on the cards rather than the turkey! I am including the file for you as a free download this week, too! To Prepare: Duplicate and cut apart the Sight Word Santas and the present. Mix up the Santa cards. Have the children hide their eyes while you hide the picture of the present underneath one of the Santa’s. Ask them to lift their heads up when you are done hiding the present. Then have the children chant, “Santa, Santa! Ho, ho, ho! Santa, Santa, where did it go?” Chose one child to tell you the sight word Santa that he or she thinks the present is hidden under. Once he or she says the word, that person may lift up that card. If the present is hidden under there, then that child is the winner of that round. If not, then another child gets a turn to guess. Play continues in this fashion until the present is found. If you wish, you may let the child that finds the Santa be the next one to hide him. However, be aware that this likely means that every single child in the class will want a chance to hide the present, so in a whole group situation, this may not be advisable because the game would be too long. Have fun! Day One: Write the numbers on the squares of paper so that they are ready to go. I wanted my students to use a fine tipped black marker to write the numbers so that they would show up better on the construction paper, so we needed to have some extra papers for them to use if they made a mistake writing the numbers, since marker cannot be erased. Then when they are finished writing the numbers, they can cut the corners off of each square of paper, and practice putting them in order if there is time. I would have them put their squares in an envelope with their name on it to save for the next day. Day Two: Cut out the pre-traced hat. 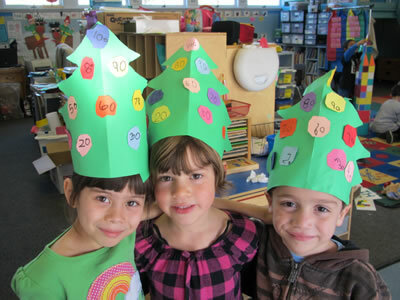 Put the numbers in order on the hat, and check with an adult to make sure that they are ordered correctly. Then glue them down. After that, when the hat is done, they can read the numbers back to an adult. Then the adult can staple the strip onto the back of the hat and fit it to the child’s head. 5. 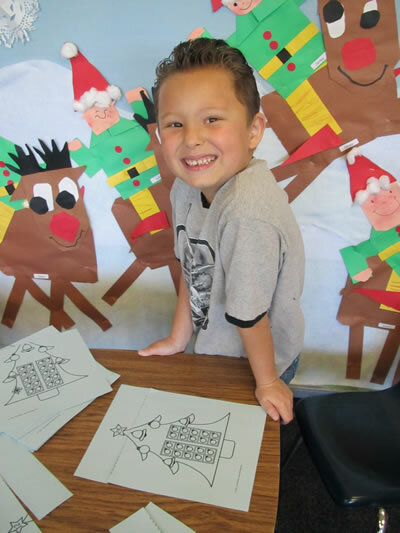 Christmas Worksheets: Free Downloads!!! Here are the latest in some holiday worksheets that I constructed for my class and coworkers this week. I hope that they are useful to you! Christmas Graph Worksheet: This little graph has got a Santa, some elves, some reindeer, and some presents to count. 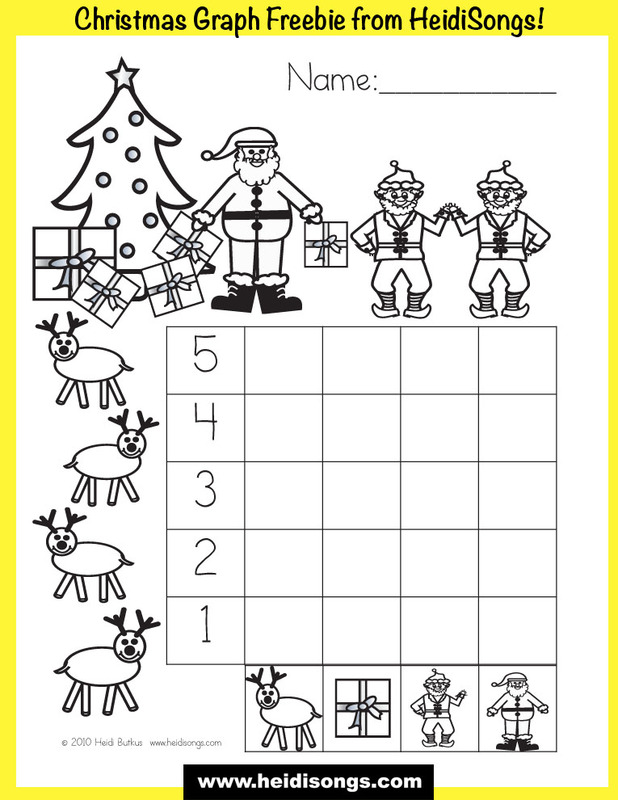 Christmas Counting Worksheet: These worksheets give kids practice counting out quantities from 11-20. They count bells, ornaments, and gingerbread men! 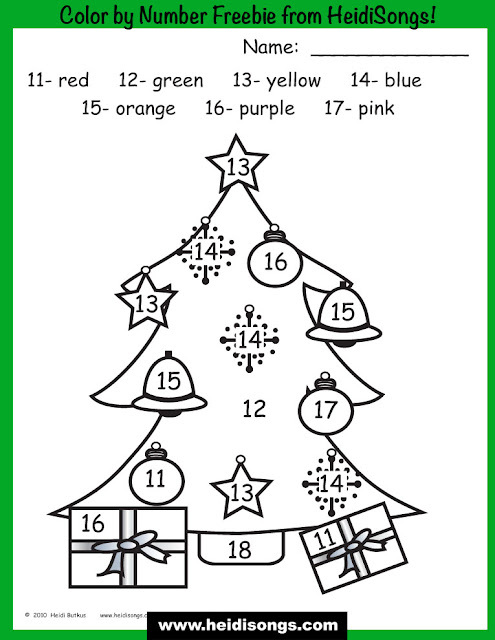 Christmas Tree Color Words Worksheet: This color-by-number worksheet helps kids practice the color words and also the numbers 11-17. I hope that you enjoy all of these little "gifts!" It was my pleasure to make them and give them to you! I hope that they make the holidays a little more merry for you and your students! Heidi...Congrats on your nominations!! You certainly deserve to win! Your blog is extra fun this week. Thanks for all the freebies. As usual, I can hardly wait to go back on Monday to begin implementing all your ideas. Keep up the OUTSTANDING work. Good luck on the voting (how many times & how often can we vote?) & have a well deserved, peaceful, healthy break. You are both so welcome! I'm so glad that you like my ideas- but especially glad to hear that I am loved!!! In answer to how many times you can vote, you can only vote once from each IP address, I think. So basically, just once from home, and once from work, etc., as far as I understand it. That's so WONDERFUL to hear! It truly gives me chills to read that you are rejuvenated and loving teaching! I love my job, too! My husband and I have been discussing whether or not I should job share next year, and even as much as I need the time, I am having trouble with the idea of letting go! Of course i voted for you! You share such wonderful ideas! P.S. I will certainly vote for you! We can count them as we go. We are very smart you know. I hope you enjoyed the conference! Your syllables song is cute! 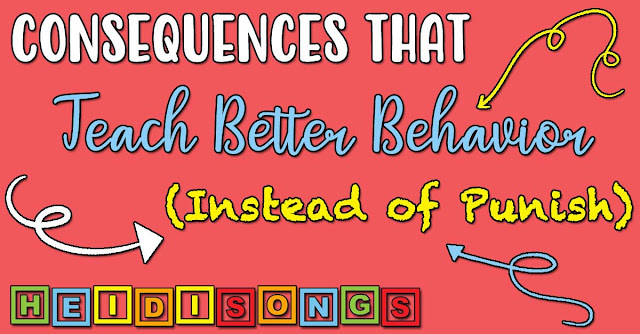 I have one on my Little Songs for Language Arts CD, too. We used your Christmas tree color word page but my kids pointed out to me that there was no color for number 18! They colored it brown since it was the trunk. I'm sure a quick change by you will fix it easily. 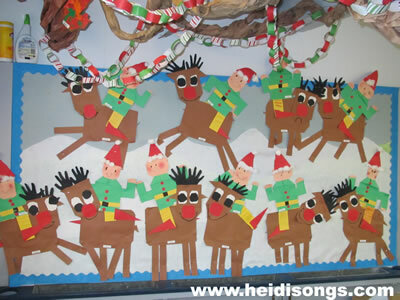 Love, love, love your reindeer and elves bulletin board. Do you, by any chance, have a tutorial for that? They are just adorable! Heidi...I have seen your name on other sites I have followed for a few years (especially Mrs. Levin's) and I have always thought I need to check you out! Well..this year a colleague gave me one of your CD's to listen to and I have become an instant fan! Thank you for your inspiration and your love for teaching!